The question I get more than any: what's it like? From the training to the actual walk, people who are thinking about walking in a multi-day charity even want an idea of what they might be getting into. After being asked for the umpth time, I started asking in return, if there was a book, what would you want to know? What could I tell you that would give you the answers you want, but without telling you too much? Rock the Pink became the format for the answers to the questions I was being asked; as a writer, this felt like the right way to go, and as a plus, it's another way to raise funds. Yep, every dime I earn on this book will be donated toward a future walk; I have planned at least one breast cancer walk this year, but after that, anything the book earns will be donated toward others' fundraising effort. I know a lot of people walking for the SGK 3 Day, the Avon Breast Cancer Walk, for the National MS Society, Heart Disease, and Leukemia & Lymphoma. Rock the Pink is available in print from most online booksellers, and currently is available for the Amazon Kindle and Barnes & Noble's Nook. Hey, I'll beg if I have to. BUY MY BOOK! SAVE THE BOOBIES! It's simple; you're considering participating in a multi-day charity walk event, but you have no idea what you're up against. 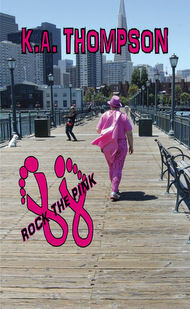 "Rock the Pink" is author and blogger K.A. Thompson's what-it's-like account of training for and participating in a 3 day 60 mile breast cancer walk. Part memoir, part guide book, Rock the Pink will outline the basics of what it's like to train-battling blisters, chronic pain, and heat-and what a new walker can expect on the event. Profits from the sale of this book will be used to raise funds for future walks. "Oh Puppy ... You have been mentioned TWICE!" thank u fer da showt owt! My walk this year is over...but check back, you never know what I might do. If I find a really good prize, I may offer it for donations for one of my walking friends! Rock the Pink merchandise: t-shirts, sweatshirts, pajamas, and more. 100% of the profits from Rock the Pink merchandise sales will go toward Walk fundraising; for 2012 this will be at least one Avon Walk and at least one Komen 3 Day Event. Bloggerized by Dzignine, based on Nekoji design.